Construct a house for yourself. A plot of land is available for sale. Obtain permission to purchase land from the steward/jarl of Hjaalmarch, Falkreath Hold, or the Pale. Purchase the land from the steward. Visit your new property, and use the drafting table to begin building your house. Use the carpenter's workbench to build the foundation of your house. Continue building your home to your liking. 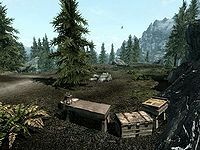 Once you've obtained the favor of the Jarl of Falkreath Hold, Hjaalmarch, or the Pale, usually by doing quests for them, you will be given the right to purchase a piece of land in the hold. In Morthal, you will need to see the steward about obtaining permission; in Falkreath and Dawnstar, it is the jarl who grants permission. After receiving permission, you may purchase the land from the relevant steward for 5,000 gold. The plot will then be marked on your map. Upon arriving at your new property, you will be instructed to use the drafting table to begin building your house. Your only option will be the Small House Layout. After selecting the plans, you will be instructed to use the carpenter's workbench to build the foundation of your house. This requires one sawn log and ten quarried stone. Having done this, the quest concludes. However, there are many more construction and furnishing options to choose from. See the construction article for more information. If you reach level 9, and have not yet started the quest, one of the jarls will send you a letter by courier. If you're friends with the jarl of Falkreath or Hjaalmarch, the steward will send you this letter; for the Pale, it will instead be this letter, straight from the jarl. If you haven't made friends with any of them yet, this letter will be sent to you from the current Jarl of Falkreath. Regardless of who sends which letter, reading it will give you the objective to speak to the jarl and advance the quest. If not yet friends with any jarl, and Rare Gifts is still in your journal when the courier sets out to find you, it will be failed and removed from your journal in favor of this quest. 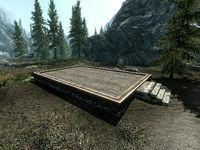 It is advisable to purchase the land for Lakeview Manor in Falkreath hold before completing Contract: Kill Helvard, as you may not be able to regain Siddgeir's favor afterwards. If you've started or completed this quest in one of the other two holds, Siddgeir will treat you as if you'd read the letter, not offer you Rare Gifts, and treat you as a friend. If you've started but not completed this quest, you cannot initiate Thane quests in other holds. BYOHHouseFalkreath: 10, 12, 20, 50, 130, 1010, 1020, 1030, 1040, 1050, 1060, 1070, 1080, 1090, 1100, 1110, 1120. BYOHHouseHjaalmarch: 10, 15, 20, 50, 130, 1010, 1020, 1030, 1040, 1050, 1060, 1070, 1080, 1090, 1100, 1110, 1120. BYOHHousePale: 10, 15, 20, 50, 130, 1010, 1020, 1030, 1040, 1050, 1060, 1070, 1080, 1090, 1100, 1110, 1120.